COMMERCIAL UNIT FOR SALE WITH TWO APARTMENTS ON FIRST FLOOR LEVEL. 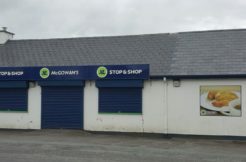 Offered for sale is a 925 sq ft commercial unit on ground floor level located at Glenfin Street, Ballybofey. The unit is ideally located near all local amenities in the town and ideal for a range of usages. Excellent road front. Storage heating installed. Two additional storage areas available at rear with parking. Apartments are located on first floor level with access to rear of building. There is a one bedroom apartment and a two bedroom apartment both in excellent condition and ready for potential tenants.